On day 3 of our Moab trip, while my wife and several of her friends created art along the Colorado River at the Lower Onion Springs Campground (approximately mile marker 21 along Utah Hwy 128, about a mile past Onion Creek Road itself), I went up Onion Creek Road and ventured beyond along the Kokopelli Bike “trail.” Actually, none of these are trails, but rather roads, and for the most part well-maintained. The GPS map is shown at the bottom of this post, and the GPX track is available as well. Photo 1. Looking east, this shows the spectacular and convoluted canyon the road will follow. Photo by Dave Casler. Taken from 38 ° 42′ 22.90″ N, 109 ° 18′ 45.52″ W.
Onion Creek Road itself has seen recent maintenance and is in excellent shape. One oddity of the road is that it repeatedly crosses Onion Creek. Once it’s over a bridge. Most of the rest are fords—you splash through the creek. 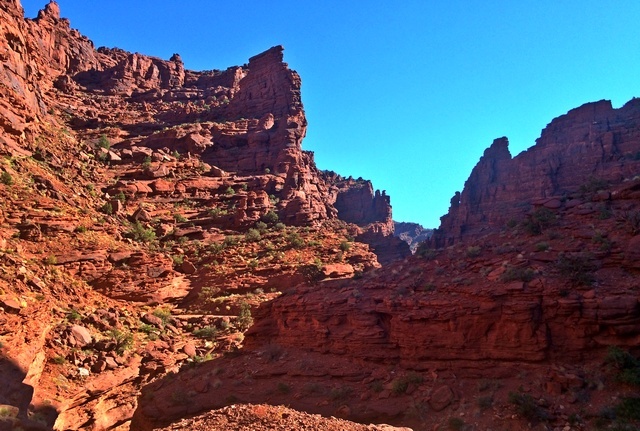 Charles Wells’ book, ATV Trails Guide, Moab, UT, which lists Onion Creek as ride 23, says you cross the creek 27 times. I counted 33! This road is most definitely a place you do not want to be during a flash flood! I traveled east along the road, winding back and forth everywhere. Such convoluted scenery! Finally the road burped me out onto a large flat area that’s under cultivation. The road runs a bit more to get to the “end” of Wells’ Onion Creek ride. I turned northeast along a badly-rutted side road, but gave it up quickly as a bad job (plus I was alone and didn’t want to get into an awkward situation). 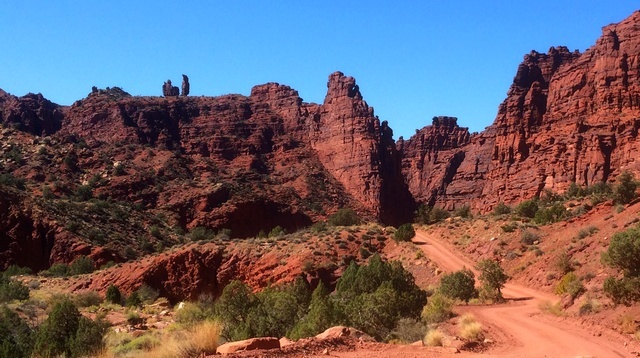 I returned, then headed south-south-east, then joined the Kokopelli Bike Trail. The Kokopelli Bike Trail, at least the part I followed, was a recently-graded dirt road in excellent condition. There were only a few stretches where I used the RZR’s excellent rough-road capabilities. By this time I was pretty much out of the really-red rock area. I went around a bend with quite a view of not-quite-so-red rocks, then took Photo 3, looking pretty much north. Photo 3. 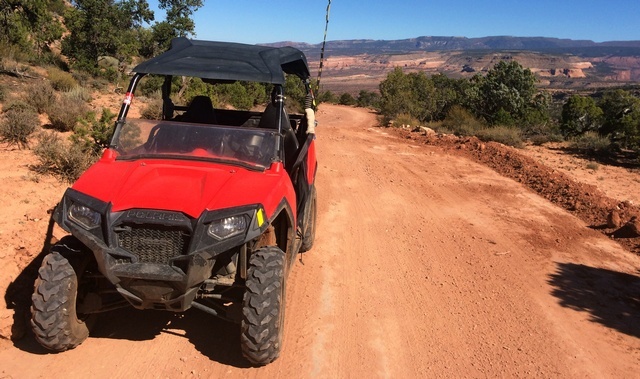 The RZR parked along the Kokopelli Bike Trail (actually a well-graded road with only occasional rough sections). Photo by Dave Casler. Taken from 38 ° 42′ 32.08″ N 109 ° 9′ 44.03″ W.
I poked along a bit further, then encountered three actual bicyclists. We had a nice chat (one is from Ridgway), then they motored on (okay, peddled on) while I had lunch. I reversed course and headed back the way I came. I took Photo 4 as I headed back into the convoluted rocks. Photo 4. You can see the road winding through the canyon. Photo by Dave Casler. 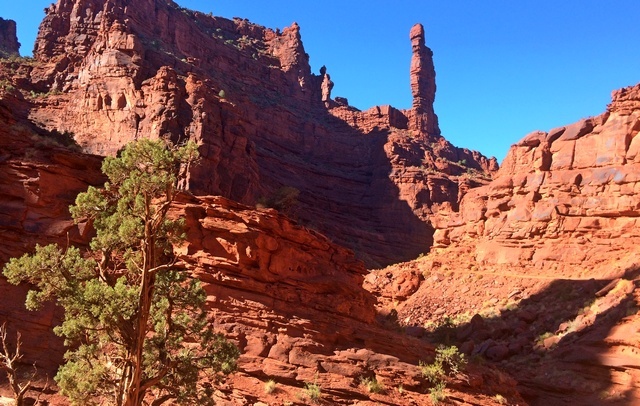 Taken from 38 ° 42′ 20.03″ N 109 ° 17′ 55.64″ W.
As I got close to the staging area, I took a side road that went east directly toward the beautiful Fisher Towers. Unfortunately it ended well short of the towers. 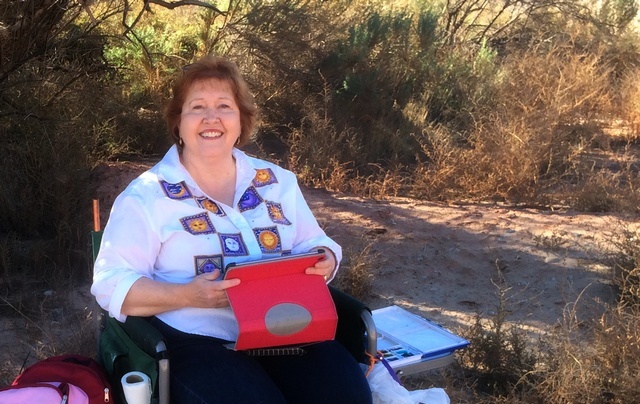 I loaded up and went back to the Lower Onion Creek Campground to find Loretta. She was under some tall brush overlooking the Colorado, painting the cliffs on the opposite side. The following photo shows her set-up. Loretta in the cool shade to capture the scenery in her painting. Photo by Dave Casler. I took Loretta back to the staging area, then we hopped in the RZR and reprised the ride up Onion Creek Road and through the magnificent scenery, up as far as where it flattens out and is cultivated. This was her only RZR ride on the trip, and she was quite delighted! Here is the GPS track. You can get a bigger and more readable version by clicking on the image. The GPX file can be found by clicking here. GPS track overlaid on DeLorme background. Photo locations are noted. CLICK ON THE IMAGE FOR A LARGER VERSION! See here for Day 1. See here for Day 2. This entry was posted in All-Terrain Vehicles (ATV) and Side-by-Side, Utah and tagged Kokopelli bike trail, Moab, Onion Creek, Onion Creek Road. Bookmark the permalink. Beautiful scenery and photos Dave !!! It is hard to believe that millions of years ago this area was under a large inland and the uplifting that has occurred since that time has resulted in this stunning landscape. And some dare say there is no God?